We’ve covered Cydia tweaks for a fair number of niche uses in the iJailbreak Toolkit articles, from our extensive Download Toolkit to the iPad Laptop Toolkit, but how about Cydia tweaks that everyone should be using everyday? Here’s a list of five free tweaks and utilities that you should absolutely have on your jailbroken iPhone, iPad, or iPod Touch. Don’t be excluded. Use xCon. Don’t want Safari forced on you? No problem! Safari’s not a bad browser–it’s fast, it’s stable, and there’s a ton of great plugins designed to support it. But it also wouldn’t be my first choice for day to day browsing. While Apple changed its policy to allow for third party browsers, unfortunately Cupertino didn’t think to include an option for setting an alternative browser as a system wide-default. Click in a link in another app and you’ll be taken to Safari. 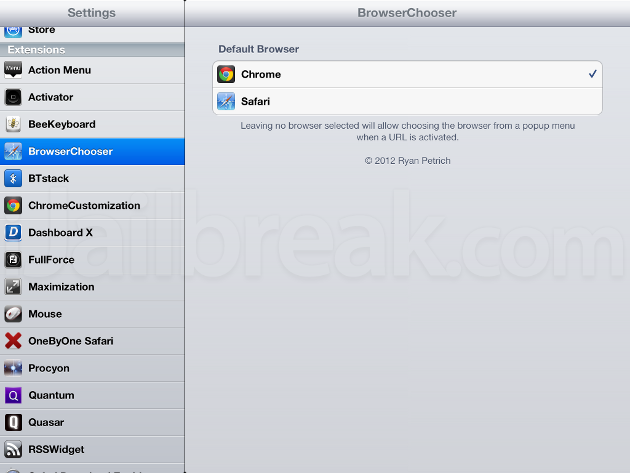 Ryan Petrich’s BrowserChooser allows you to switch to a different ‘default browser’. Currently it supports Google Chrome, Opera Mini, iCab Mobile, Dolphin Browser, Atomic Browser, Diigo, iLunascape, MammothIV, Puffin, Mercury, and Safari. If you prefer the desktop-style Google Chrome browser on your iPad, BrowserChooser is an essential tweak. Like the way iOS works, but think it looks bland by default? Who says looks are only skin deep? By changing the way the interface looks, WinterBoard is a tweak that changes the way your iPhone, iPad, or iPod Touch feels, making it personal and marking it as yours. 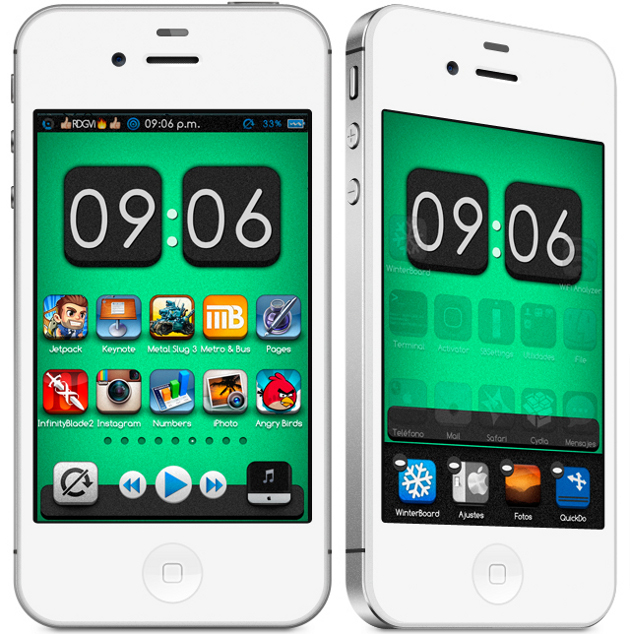 WinterBoard can skin nearly everything, from the lock screen to the icons to the status bar. You can even make new themes yourself, with a little work. There are almost 16 thousand WinterBoard-comparable themes–just counting themes that are categorized as modding the springboard. Some are great and others are absolute garbage. We can help you sort through them on our sister site, iCydiaThemes. 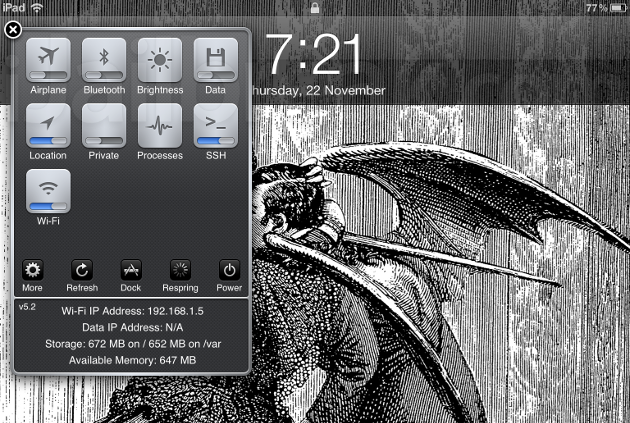 There’s a reason SBSettings is the first utility I install every time I update and jailbreak–it’s just so convenient. With one gesture you can pull up a menu that contains all the useful settings toggles, your Wi-Fi and Data IP Addresses, and a quick method of respringing or resetting into Safe Mode. It even includes advanced utilities for locating app folders and disabling Mobile Substrate Addons. Not only is SBSettings invaluable, but with the right theme, SBSettings looks great. It’s such a great Jailbreak feature that Steve Jobs should have mercilessly ripped it off since iOS 2.0. A powerhouse utility with thousands of possible settings, by default. What could possibly be a better jailbreak utility than SBSettings? How about an underlying tweak SBSettings relies on? 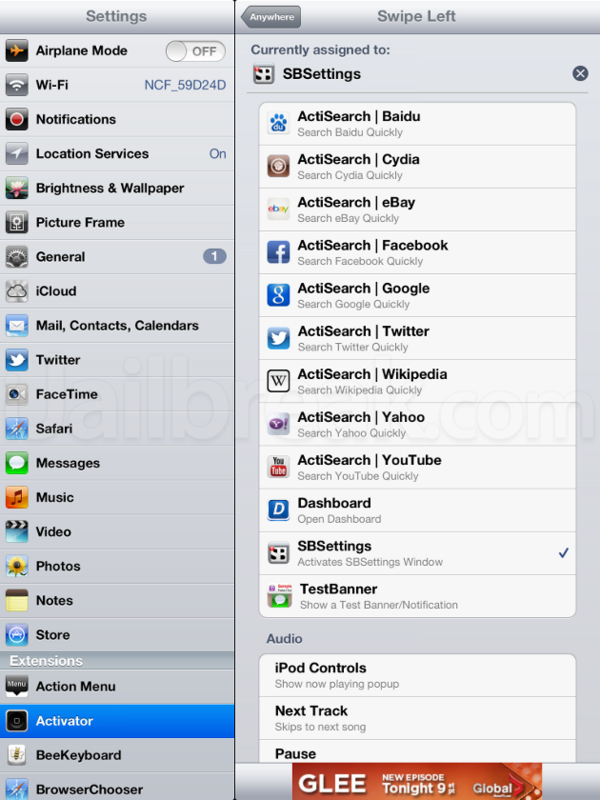 Activator is a utility that can execute nearly any function of the iPhone, iPad, or iPod Touch with an expandable set of features and input methods. By default you can use Activator to quickly open your favorite app with a swipe, ignore a broken home button, and even control toggles and iPad playback. Activator really gets cooking when paired with utilities like BeeKeyboard or TerminalActivator, as it allows for keyboard shortcuts and personalized remote triggers. With a little creativity, Activator is an incredibly useful tweak. Did we cover the essentials, or is there another day-to-day tweak or utility you can’t live without? Share your thoughts and your favorite tweaks in the comments section below. whats the theme your using for the winterboard pic… i really like it..
That one’s called ByCon. It’s one of the recent themes that stood out on iCydiaThemes.